It was announced yesterday that I was named a 2019 Pulitzer Prize Finalist. And congratulations to the other finalist, Rob Rogers, another great cartoonist, who was fired from his Pittsburgh Post-Gazette staff cartoonist position of 25 years for drawing cartoons critical of Trump, a situation he handled with dignity, integrity and humor. I'd just seen Rob speak about this last week, as I wrote here. - Daily Kos, which has done so much for progressive politics and for political cartooning and for Tom the Dancing Bug! And of course I thank Tom the Dancing Bug's INNER HIVE, which literally saved the comic strip when I started the Hive in 2012 and still saves it every single week. As I said to them in this week's mailing, I share the honor which each and every one of them, because they are on the Tom the Dancing Bug team and are an essential part of the Tom the Dancing Bug process. With the decline of print newspapers, INNER HIVE subscribers sustain the new business model that makes Tom the Dancing Bug a viable enterprise. In return for their subscription fee, they get Pulitzer Prize-losing comics a day before they appear anywhere online, as well as commentary from a Pulitzer Prize-losing cartoonist. All this plus jokes, behind-the-scenes looks, extra exclusive comics and whatever other benefits and privileges I can dream up or make up. Information on how to join the INNER HIVE can be found here, or you can simply and directly join through Patreon here. Anyway, I truly appreciate all my partners, friends, fans and readers, in whatever capacity they support or enjoy Tom the Dancing Bug. I already feel so fortunate to have the privilege of making comics that are read by so many people. Being honored for my efforts is an extra thrill because I can hope that honor can help justify the support I've received and reflect well on the friends who have believed in me and the strip. *Not the way it works. To comment, please use Twitter. Hey, I'll be conducting Office Hours this Saturday, 4/6/19, in NYC at the MoCCA Arts Festival, from 3pm - 5pm. Come on by the National Cartoonists Society booth (A122); I'll be giving out fist-bumps, answering questions, asking questions, toting books, and kissing babies. Any last-minute changes will be posted on this space and my twitter account. The really hilarious thing about this week's comic is that it's based on a real place. Homestead Temporary Shelter for Unaccompanied Minors is in Homestead, Florida, and kids 13-17 are housed in the facility run for profit by a subsidiary of Caliburn International. It's for children who applied for asylum in the U.S., but "unaccompanied" isn't always accurate, because that's the designation for children arriving without parents, but they may have arrived with adult siblings, other relatives or family friends. Separate from Trump's monstrous family separation policy, this treatment of "unaccompanied" minors differs significantly from the treatment under Obama: It apparently takes much more time to place the children out of facilities with sponsor families and relatives, and there are reports that the children are being used as "bait" for sponsor families and relatives to come to claim the children and then get deported. There is no great solution for the humanitarian crisis in Central America, but I know that cruel and punitive deterrence policies deliberately inflicted on children can't be any part of the United States of America. You can read more about Homestead here: NPR; Miami Herald; Concord Monitor; Berlin Consulting. This week's comic has some statistics in it, and I thought I'd share the sources that I wrote about to the INNER HIVE on Monday. Because the only the best comics have footnotes! "49 out of 50 extremist murders in 2018 were committed by domestic right-wing terrorists." OxyContin "promoted its use to doctors as safe and non-addictive, contributing to an addiction epidemic that now kills about 130 Americans every day." 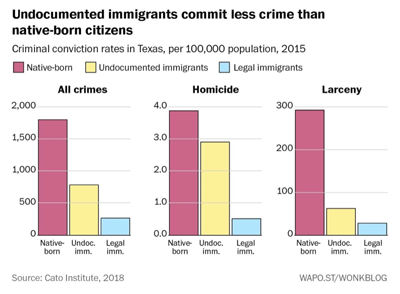 Undocumented immigrants are "convicted of crimes at a rate of about 0.75%"
And Wikipedia lists 26 "key" members of Trump's 2016 campaign, five of which have now been indicted or pled guilty. This year, you can give that special someone a Gift Membership to Tom the Dancing Bug's INNER HIVE. and all other benefits and privileges of membership will be conferred up on them. It is for you to inform the recipient of the gift. The recipient will simply receive the next INNER HIVE email after you sign them up. More info on the INNER HIVE is here. IT'S THE GIFT THAT KEEPS GIVING, EVERY DING-DONG WEEK, UNTIL IT STOPS. Thank you, and have a Merry Everything. Terms and Conditions apply. They always do. The Gift Membership will end 12/31/19. Payment is for starting the membership. Recipient may cancel at any time (there's no accounting for taste). An interview I did with GoComics is now up on their blog. Here. I have a lot less control over what I write about than people would guess. I’m not talented enough to pick a subject or a target and then be sure I’ll come up with a great comic. Nor do I think of lots of comics ideas and then choose the best one. My process is that I stare at a blank piece of paper for a long time, or write very stupid things on it, and then, eventually, suddenly, one idea comes to me. One. And that’s the Tom the Dancing Bug for that week. 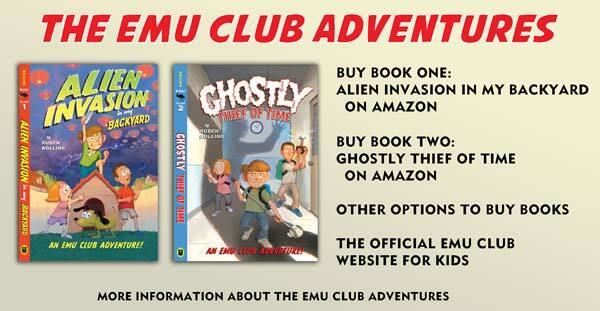 In celebration of Jeff Kinney's incredible endorsement, and in preparation for the upcoming holiday gift-giving season, for a limited time, I'm again offering copies of The EMU Club Adventures, Books 1 and 2, with a personalized signature and drawing in each. SHARE THE JOY OF EMUS WITH YOUR LOVED ONES. "There are tons of little mysteries all around us. Sometimes if you look really, really closely at them, you find out some amazing, incredible things. And you might just save the world." You can buy both books, signed and sketched, shipping included, for $59.95. Continental U.S. only for now, please. If you would like the books signed "to" a particular name (your name, the name of a gift recipient, etc. ), type that name in the field below. If not, you can leave that field blank. If you're a member of Tom the Dancing Bug's INNER HIVE, enter the email address you use to subscribe in the field below. If you're not, no problem! Just leave that field blank. OFFER RUNS ONLY THROUGH FRIDAY 12/7, BUT MAY END EARLIER DEPENDING ON SUPPLIES. UPDATE: OFFER HAS EXPIRED. THANKS TO ALL WHO ORDERED! … or you can purchase them elsewhere by clicking here, or even by going to a bookstore! For some reason, I feel moved to put this back up on the blog. I helped produce this back in 2013, after Sandy Hook. Absolutely nothing has changed since then. This week's comic, More Richard Scarry's 21st Century Busy Town Jobs, is making the rounds across the web and social media, so I thought I'd post the first comic I did in the format, from 2014. These two comics have been among my most popular, which makes me happy because I really loved drawing them in Scarry's style. By the way, please do join the INNER HIVE for much more Tom the Dancing Bug, including each weekly comic strip emailed to you at least a day before it is published online, extra comics, commentary, prizes, and whatever else I can throw in there. JOIN HERE.